Eureka! Pongwiffy has just conjured an amazing spell, a wall of smell to protect her hovel in a dump site. It's so disgusting that nobody can get near it without her secret magic formula. Now she's ready to organize the best-ever Halloween Bonfire party, featuring a fancy dress parade. Pongwiffy has even persuaded her sometime best friend, Sharkadder, to be a judge. Everything's coming up stinkweed -- until her Broomstick goes missing, then shows up white as a sheet, and practically splinters at the whisper of "Goblin!" Pongwiffy's desperate. What have the Goblins done to Broomstick? Is it contagious? And who's this down-on-his-luck genie lurking around her precious dump? Clearly he's up to no good. 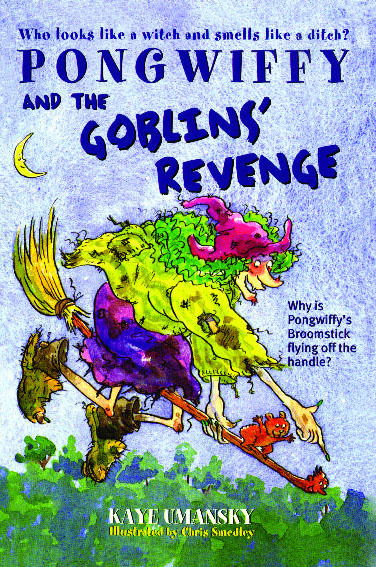 It's curtains in the coven for Pongwiffy unless she can pull off a slam-bang parade and outwit the evildoers before everything goes to heck!